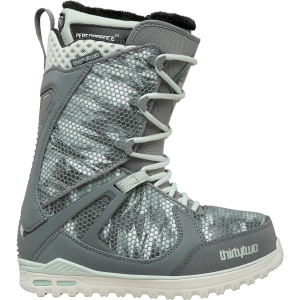 Designed with the premise that one boot should be versatile enough to transition from heavy park jumps to slashing pow without skipping a beat, the ThirtyTwo Women's TM-Two slays the entire mountain with a highly responsive, super-lightweight feel. As the team choice for ThirtyTwo's female riders, the TM-Two is the stiffest boot in its women's-specific line for seamless energy transfer when you're blasting turns faster than anyone else on the mountain. The TM-Two features a traditional lace closure for the fine-tuned fit and precise power we've all come to love from regular laces. Its tongue tension system improves heel hold by preventing the lower zone from loosening as you ride. Enhancing flexibility, the articulated cuff helps you perfect those tweaked-out grabs and stylish presses in the park. Truly customizing the boot's fit and feel, the Level 3 liner comfortably wraps around your foot without pressure points, thanks to its heat-moldable Intuition foam. The Level 3 footbed features a dual-density heel pod to prevent painful heel bruising, should you knuckle the jump landing. Offering even more heel cushioning, System G2 Gel soaks up nasty impacts in the park and vibrations from hard, choppy snow. Moreover, its Evolution Foam sole not only offers an insanely light feel, but it's also aggressively lugged for sure-footed traction when you're hiking for freshies.